Fiji's military has warned ousted Prime Minister Laisenia Qarase not to incite unrest, threatening to arrest him if he returns to the capital Suva. Mr Qarase has said he plans to return to Suva, having been banished after last week's coup. He has urged peaceful resistance to the new leadership. Coup leader and army chief Cmdr Frank Bainimarama said his comments showed a "willingness to resort to violence". He was speaking as another ex-PM was cleared of inciting an earlier mutiny. 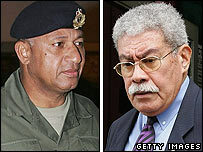 Sitiveni Rabuka had been accused of encouraging senior military officers to rise up against Cmdr Bainimarama in November 2000. Cmdr Bainimarama said troops and checkpoints would remain on the streets after Mr Qarase indicated at the weekend he would return to Suva from his home on an outer island. The democratically-elected former prime minister - who insists he remains head of the country - has also called on Fijians to hold peaceful pro-democracy protests. "It gives us reason to believe Mr Qarase and his supporters are willing to resort to violence," Cmdr Bainimarama said. He also hit out at Australian Foreign Minister Alexander Downer, who like Mr Qarase has urged Fijians to show passive resistance. Such comments "could incite people, and their actions could very easily turn into a situation where the military will have to confront them with force," he said. Dissenters were warned by the military at the weekend to keep quiet or face being taken in for questioning. But the military is facing some powerful opposition, with both the Great Council of Chiefs and influential church groups denouncing the coup. Cmdr Bainimarama assumed presidential powers after dismissing the government in last Tuesday's coup. A state of emergency is now in place. He says the military has received more than 300 applications from people interested in ministerial positions after adverts for interim government jobs were placed in weekend newspapers. Sitiveni Rabuka - who served as elected prime minister in the 1990s after leading two coups in 1987 - has spoken of his relief at being found not guilty of inciting mutiny. "I'm free. I'm glad to be cleared of suspicion. I knew the facts, it was a matter of all the evidence and facts coming out," he told reporters outside the court. High Court Judge Gerard Winter told Mr Rabuka: "I hold honest and reasonable uncertainty in my mind of your guilt." His decision to clear him came after a jury failed to reach a verdict in the case. Mr Rabuka was accused of inciting senior military officers to seize control of the Queen Elizabeth Barracks, the army's main headquarters, near Suva in November 2000. Cmdr Bainimarama escaped assassination after jumping through a window. The mutiny, which failed, was linked to a coup led by indigenous armed nationalists against the country's first ethnic-Indian prime minister earlier in the year. The coup in May 2000 ended without bloodshed after Cmdr Bainimarama imposed martial law and installed Laisenia Qarase as prime minister - a man he now accuses of corruption. 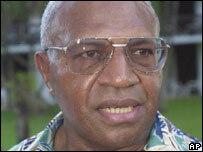 Cmdr Bainimarama's actions angered some within the military who had sympathised with the leaders of the May 2000 coup. Tensions between the ethnic Fijian majority and Indian Fijians, who make up roughly 40% of the population, lie at the heart of each of the Pacific nation's four coups in the past two decades.